Hi, It's Sophia again. This is our Tuesday's Tails post and we are trying to help Daisy find her Forever Home. 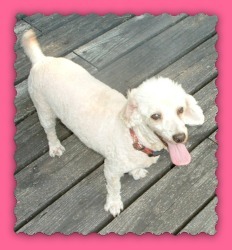 Daisy is a Miniature Poodle and has been at Riverhill Rescue (in Missouri) since April. She is about three years old. Daisy is a retired breeder but is really social and sweet. Because of her time in the breeding facility, Daisy is hearing impaired. She hears, but just not very well. Daisy is leash trained, crate trained, and pretty much house trained. And she likes and gets along with other dogs. If you want to know more about Daisy, click here. I sure think she would make a great sister for someone or she could be just an only child. I'm sure she wouldn't mind either one, if she could just have her own home. Well, that's it for today. We hope we can come back later and report that Daisy has found her Forever Home. Daisy is beautiful. 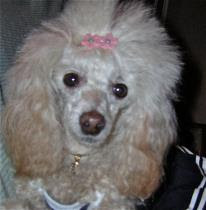 It is very rare to find a Poodle in a shelter around here, we hope she finds a loving home. What a sweetie! Thanks for joining the blog hop! Awww, what a sweet, sweet face. Surely it won't take too much longer for her to get adopted. Sounds like had a really rough first three years. Let's hope her furever home showers her with love and makes those early years a distant memory.